Between 1933 and 1941, the Nazis sought to make Germany judenrein (cleansed of Jews) by making life so difficult for the approximately 600,000 German Jews that they would be forced to leave the country. By 1938, about 150,000 German Jews, one in four, had already left. After Germany annexed Austria in March 1938, an additional 185,000 Jews were brought under Nazi rule. Many German and Austrian Jews who wanted to leave were unable to find countries willing to take them in. A substantial percentage tried to go to the United States but were unable to obtain the necessary immigration visas. The US Congress had established immigration quotas in 1924 that limited the number of immigrants and discriminated against groups considered racially and ethnically undesirable. President Franklin D. Roosevelt, responding to mounting political pressure, called for an international conference to facilitate the emigration of refugees from Germany and Austria, and to establish an international organization to work for an overall solution to the refugee problem. From July 6–15, 1938, delegates from 32 countries met at the French resort of Evian on Lake Geneva. Roosevelt chose Myron C. Taylor, a businessman and close friend, to represent the United States at the conference. During the nine-day meeting, delegate after delegate rose to express sympathy for the refugees. But most countries, including the United States and Britain, offered excuses for not letting in more refugees. Only the Dominican Republic agreed to accept additional refugees. 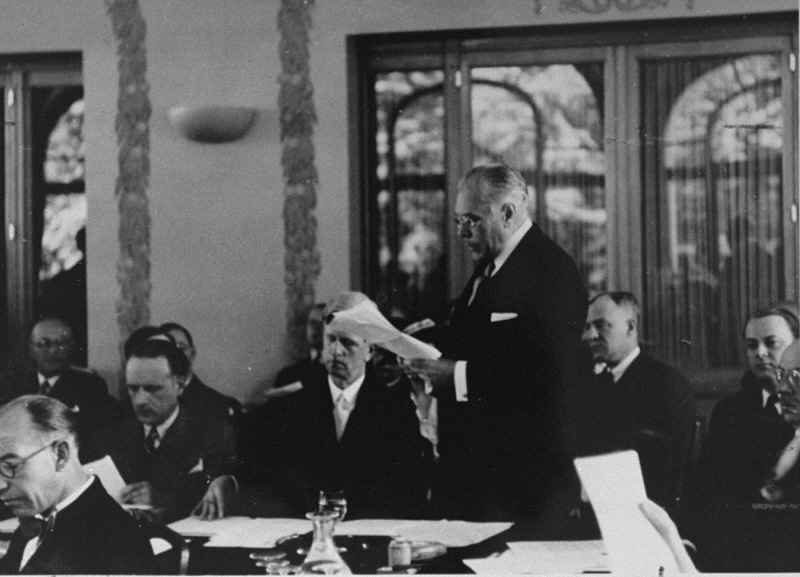 The conference attendees created the Intergovernmental Committee on Refugees (ICR), charged with approaching "the governments of the countries of refuge with a view to developing opportunities for permanent settlement" and seeking to persuade Germany to cooperate in establishing "conditions of orderly emigration." The ICR received little authority and virtually no funds or other support from its member nations. Its achievements were minimal before the beginning of World War II in September 1939 largely ended all efforts. Widespread racial prejudices among Americans—including antisemitic attitudes held by US State Department officials—played a part in the failure to admit more refugees. In the midst of the Great Depression, many Americans also believed that refugees would compete with them for jobs and overburden social programs set up to assist the needy. July 6 - 16, 1938 News articles about the Evian Conference. July 6 - 31, 1938 Editorials, op-eds, letters to the editor, and political cartoons reacting to the Evian Conference and the refugee crisis. April 1938 - Jun 1938 News articles, editorials, op-eds, letters to the editor, and political cartoons responding to the increasing refugee crisis spurred by the German annexation of Austria. Breitman, Richard and Alan Kraut. American Refugee Policy and European Jewry, 1933–1945. Bloomington: Indiana University Press, 1987. Caron, Vicki. Uneasy Asylum: France and the Jewish Refugee Crisis, 1933–1942. Stanford, CA: Stanford University Press, 1999. Feingold, Henry L. The Politics of Rescue: The Roosevelt Administration and the Holocaust, 1938–1945. New York: Holocaust Library, 1970. Wyman, David S. Paper Walls: America and the Refugee Crisis, 1938–1941. New York: Pantheon Books, 1985.